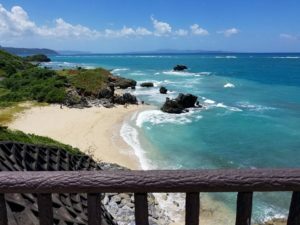 As with many other tourist areas, Okinawa is a place that takes several weeks, if not months, to fully explore. The island is about 70 miles long and 7 miles at the widest point. The narrowest section is two miles. The lush tropical vegetation includes gorgeous flowers. Okinawa is a strategic land mass located in the China Sea, about 400 miles from the main Japan islands, the same distance from Mainland China, and 300 miles north of Taiwan. During the World War II Battle of Okinawa, lasting 89 days, the Imperial Japanese Army lost 95,000 soldiers, the Americans lost over 12,000 military, and over 149,000 Okinawans lost their lives through battle injuries, civilian casualties, and suicides. The Okinawa Prefectural Memorial Peace Park, a landscaped masterpiece also in the city of Naha, contains many amazing reminders of the reasons humans should strive for peace over war. Bombing and shelling during the WWII Battle of Okinawa reduced the Shurijo Castle to rubble and the main building, the Seiden, to dust. 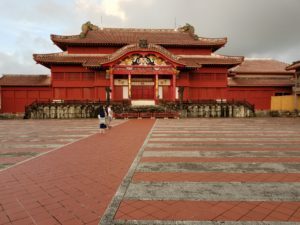 The castle was the principal seat of power for Okinawan kings for 500 years. Reconstruction plans blossomed after the United States relinquished control of Okinawa back to Japan in June 1972. Architects rebuilt the Seiden, the formal reception area and meeting location for the King and his court, based on an 18th century model. Parts of the castle, however, reflect even earlier times of the 14th and 15th centuries. The Seiden connects with several buildings in the Castle complex, including the women’s quarters, the men’s quarters known as the Ouchibara, the Shoin—the King’s daily business area where aides and envoys met, the Sasunoma—an anteroom for princes, and a terraced rock, palm, and exotic flower garden which connects the Shoin and Sasunoma. Several parts of the buildings require no shoes. Watchers dressed in ornamental kimonos, robes, or costumes oversee all the tourists, answering simple questions in English or in more detail for Japanese tourists. The art includes stone and painted Shishi (Okinawan Lions) guarding doorways and ornamental dragons. Rounded clay tiles, bright orange, adorn the roofs of the main buildings and contrast well with the deep, dark red of the exterior and much of the interior wood. 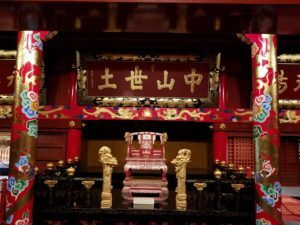 The exquisite and detailed Oriental artwork graces the outside and inside walls, with the King’s throne room a magnificent collage of dragons, Shishi, and huge letters covered in gold gilding, contrasted with black and red relief on all but the floors. Not only is the main castle, it’s gates, and immediate grounds loaded with historic and cultural ambiance and information, the Castle Park extends around the main buildings for several acres. Included in the sites to see are they Ryuhi Spring, the Ryutan man-made lake, the Tamaudin, a mausoleum for the 2nd Sho Dynasty.